by Dave from The Longest Way Home ~ April 21st, 2011. Updated on October 5th, 2013. Published in: Travel blog » Malaysia. It’s a very easy day trip as the caves are only 13km out of Kuala Lumpur. I took Bus 11/11d from Bangkok Bank Terminus. Close to Central Market. There was a German on the bus too, and even they only complained twice about getting there. So, it’s not too hard once you’ve found the bank! Getting back can be a 30 minute wait, but the bus is generally not so crowded. Bar from public holidays, weekends, celebration festivals etc. Do you have to take a tour? No, but a lot of people seemed to be on tours when I was there! 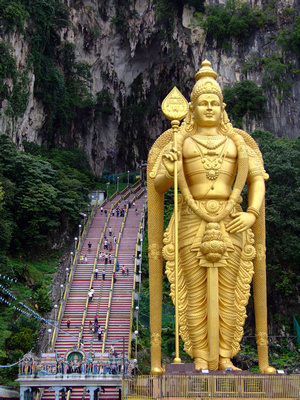 Possibly the star attraction to Batu caves is the world’s tallest statue of Murugan ( 42.7m/(140.09 feet ), a Hindu deity. Standing in front of 272 numbered concrete steps leading to the main Temple or Cathedral Cave. Normally I am not so impressed with such statues. And, many Malaysians I spoke with saw nothing so impressive with it. But, I must admit I found it quite impressive. Certainly it’s better to look at than countless shopping malls in Kuala Lumpur. Also worth a peep is the giant 50 foot blue statue of Hanuman, the noble monkey devotee and aide of Lord Rama, near Ramayana Cave. Cool temperatures, railings, lots of statues and even more Indian tourists than one could think possible posing for photographs. Yes, pick a weekday to visit the caves if at all possible. Otherwise the crowds of Hindu’s visiting the caves may thwart your peace of mind. That said, everyone was very polite and nice, except for one North American with more camera equipment than your average National Geographic photographer. At least, I hope so. With a tripod wider than nearly two people, the “gentleman” took over 5 minutes to compose every shot. Blocking the view for everyone else. It was a sad thing to see as people were obviously disappointed, and were forced to take photos with said photographer in the background of nearly every statue. The German didn’t take photos. But, I noticed an Indian man tapping his toes to the side. A Londoner. Moreover, a Londoner dressed like an Indian / Malay, Hindu deity visiting chap with a small camera. The clarity of his English didn’t flinch the American. Identified as such, by a stars and stripes badge, or two, on his jacket and hat. We all shuffled on. But, some how were always at an impasse at each statue. The blockage? Said, photographer. Batu Cave was in need of a laxative to flush out this Nikon wielding gunslinger. With a queue of increasing people behind us. The Londoner about to start a soccer riot. And, the non caring German blurting out harsh Germanic words, loudly, it seemed things were getting blatantly obvious. Still the photographer seemed oblivious to all but his most accurate of settings. Frustration overflowing we stepped in near unison in front of the light metering, manual focusing over-pocketed photographer. It should have been enough of an enema. But, strangely he said nothing and just stood there with a mild look of disdain. Camera settings near ready, tripod extended. I took the photo in under 20 seconds. The Londoner seemed to have problem though. “Try a tripod?” suggested the German pointing to me while looking at the American with a blantantly brazen smile. So with that, the Londoner and I fumbled for an unreasonable amount of time attaching his pocket camera on to my tripod. Meanwhile, seeing that we weren’t actually taking a photo people moved around us taking their own photos, blessing themselves, and moving on with smiles and well oiled baby heads. An audible huff blew out from the photographer as he finally scooped up his tripod with a clacking of metal. Marching further on into the cave, he didn’t get far. He was now behind the rather large crowd that had finally overtaken his one man blockage. “Shame that,” I said looking ahead. A short victory laugh later and we walked on in relative peace. But, deep down, I think we all were hoping to bump into some-more “professional” photographers. Inside buildings, tripods are banned in many places around the world. Primarily due to people like this guy setting up a whole photo shoot when others are trying to pay homage to their religion, or simply take their own personal photos. I am really all for bringing in tripods. But, can see why they are banned in so many places. 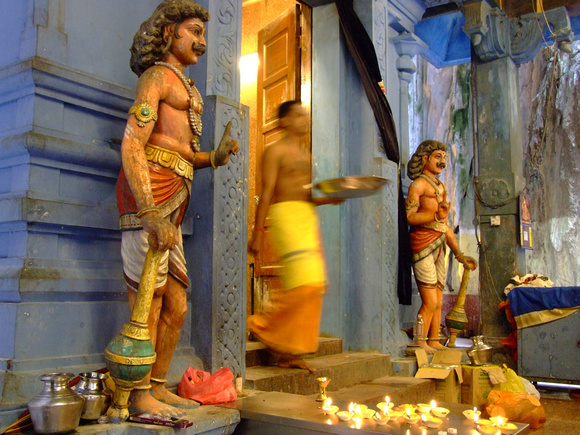 If you are a pro, apply for some private time at a temple, or go when it’s quite. If not, don’t spend more than a minute blocking everyone’s view. Have your camera set up, tripod extended and get on with it. Remember that 10,000’s of people have already taken that same shot over the years. It’s not that special. Even if you are carrying enough equipment to feed a family for a few years. 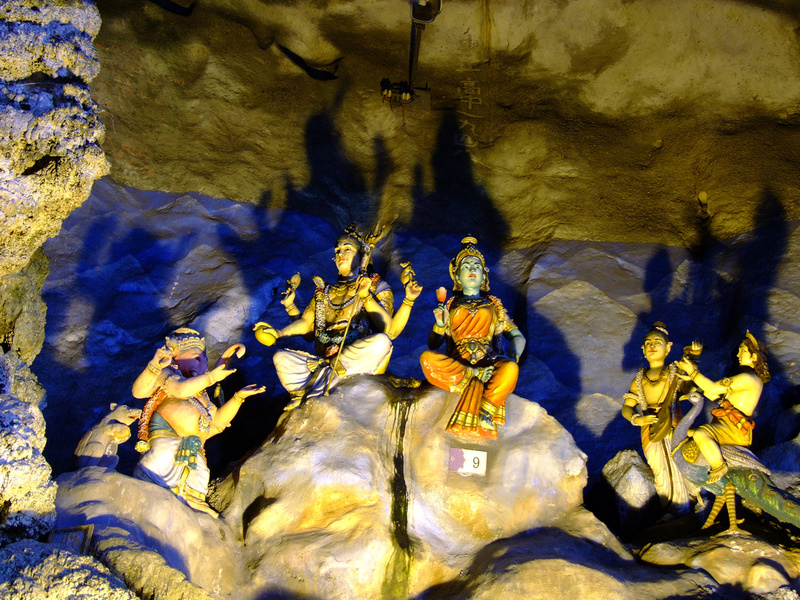 Perhaps one of the most enjoyable, although slightly worrying activities at Batu caves is climbing the 272 numbered steps leading to the main cave. Not for anything else other than watching the territorial monkeys jump on the tourists and visitors. The macaque monkeys are not afraid of people, are territorial and possibly very spoiled by numerous tourists feeding them. The result is many macaques will randomly pick on a tourist and bounce off their head either on the way up, and down. While many locals laugh at this. There have been a few tourists terrified into running away. With large teeth, sharp claws and little fear there have been bites along with scratches reported. 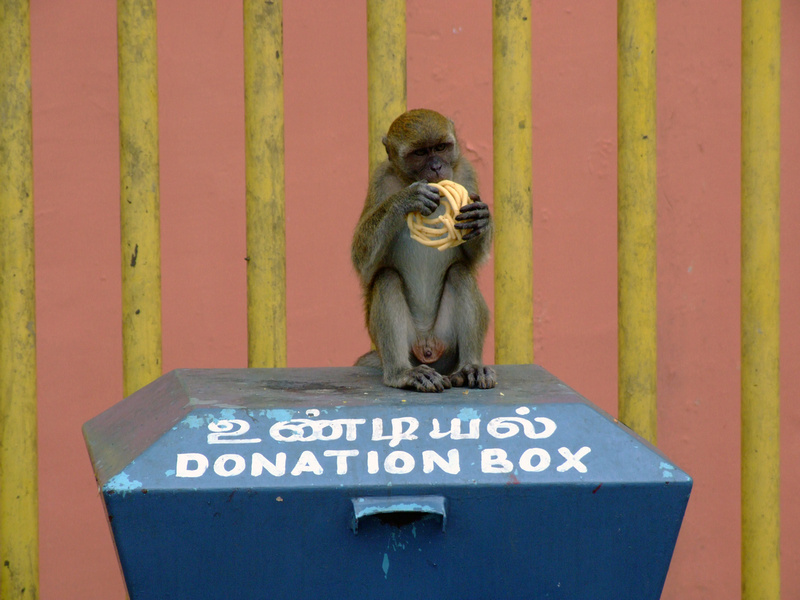 The monkey’s are there for many reasons. Religious rights, tourism; the list goes on. Batu Caves are very popular for both tourists, and Hindu’s alike. With the caves dating back over 3,000 years, I don’t know what came first, the temples, or the monkeys. All I know now, is that something will give way in the future. Someone will end up getting hurt, or sick unless something sensible is done. Quite what, I don’t know given the religious implications here. That said, it’s a good example of how not just tourism can effect a place. But, also how humankind in many other ways can alter things beyond an original intention. Ugh, I can relate. I get super annoyed by traveling photogs that fancy themselves National Geographic photojournalists and are insensitive to others. However, I might add that these types come in all nationalities– not just North American! I’ve seen many an Australiam and German snapping photos in people’s faces and using flash photography at inappropriate times. Ps- love the monkey! So did I. And, I think it is to a point. But, holding up people combined with this is probably the best reason all together. Um… Taking photograph inside a crowded temple is gonna get in my nerves. In a very dark environment it takes time to think and choose the right setting and the right angle. with all the people coming and going I’ll just become very disturbed and impatient and then will produce bad quality photo in the end. So definitely agree that it’s always better to go when it’s quite. It’s true that light and shadows will effect taking photographs inside to the extent that you need some time. If you are a pro and doing this for payment, then certainly booking private time would be ideal. But many people these days can, and do buy a pro camera and then think they are pro’s, show up, and spoil the real purpose of a temple for everyone else. I’ve seen those gunslinger photographers too. The worst are the ones with those huge belts running around, they really look ridiculous. But I’m curious now, how much gear do your walk around with? Yes I have a tripod, not used for the monkey but for the other photos yes. I have 3 lenses, and a tripod. The tripod was really small and lightweight but rather stupidly I lost it recently and had to get a new one. The new one is a little bigger, heavier and doesn’t fit into my bag so well. I’ll have to see what’s more important now, a smaller tripod, or more convenient. I think the later, as I don’t use it that often. Sounded like an eventful day Dave. You know I love my photography, as do you but when people setup in such a manner as your American friend at the Caves it drives me insane. As you pointed out, the same shot has been taken over and over so your not going to win any awards for originality. It reminds me of when I was in Cambodia and photographing Angkor Wat. We arrived at the temple early, and there was a lady holding everyone back from entering, until the correct opening time. This was great, as it enabled everyone to take a photo of the temple with no people in it. The cave’s actually looked like a great day out from KL. Ive only been there a couple of times on stop overs and never had the time to get out to the caves, but will definitely do so on my next trip their some time in the future. I’ve seen that kind of competitiveness too. I bet you’ll recognize the type of photographers who look at your equipment like a teenager might in a gym back in the day. Same rule applies, size doesn’t matter for the end result. But, this being human nature, size will get you more looks. Such is life! Batu caves are worth it for an easy days trip is you get the chance, just go early on a weekday, and have a quick peep at a Hindu calendar to avoid any gods birthday etc! sounds frustrating… still, the caves look beautiful. and that golden Murugan statue is absolutely breathtaking! Great sights! Not a big fun of statues but it seems to be great place to see. Reading the part about the pesky photographer reminded me of the countess times when some inconsiderate tourist would hog the area just to be able to take one photograph and they dare to be angry when you accidentally step into the frame. I think I find them more annoying than the monkeys. Ha ha, victory! I would have been fuming at this guy – there’s nothing I hate more than people who have no self-awareness and are completely oblivious to their surroundings!